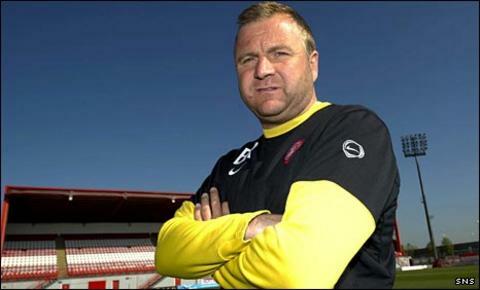 Billy Reid says that, if Hamilton Accies are relegated to Division One, they have the capabilities of regrouping and coming back stronger. Accies are nine points behind Monday's opponents, second bottom St Mirren. And Reid realises Accies would need to win all their remaining matches to have a chance of staying up. "But we will regroup and take that step back the way to move forward again and this club certainly will do that," the manager told BBC Scotland. "In the six years I have been here, we've been successful every season. "Success meaning we've progressed every year, but there's always going to be a season where we take a step back and this may be the season where we do that." Accies head to Paisley for the third time this season and Reid has not given up totally on Scottish Premier League survival. "Can we win the four games? If you take it as a game at a time, on merit there's no reason why we can't win the game," he said. "But we've only won three games all season, so people will say that's a massive ask. "We play St Mirren first and it's a place where we've done really well. The playing surface is as good as anything in Scotland at the moment and I think that'll suit us." If Accies were to avoid relegation, Reid would no doubt be seen in some quarters as a miracle worker, a tag he would love to receive. However, he is realistic while pleased with how far the club has come during his tenure. "It's been a great journey for us, three seasons in the top flight - it's the first time we've ever got anywhere near that," he added. "We finished seventh in the league last season and, when the chairman came here seven years ago, we were £4m in debt and I think he's cleared off all the debt with the money we've made selling players on. "So we've done something right."